In front of you is the second recording of hubbub. stéphane (guitar, vocals) and olivier (drums), both ex-'acrylic mushroom', and vincent (bass), ex-'racklets', are the nucleus of hubbub. 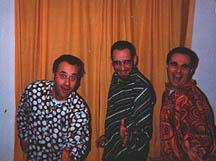 Started in 1996 as a trio, the group was assisted by marc (guitar) after a year. In January 1997 hubbub plays live for the very first time, at the ex-voto, Brussel. The first demo is recorded in May 1997 with the help of Boxson, a small studio in Saint-Gilles, Brussels, and was released on tape. It was reviewed by rif-raf, and got reaction on national radio (StuBru (BasSta !) and 21 (rock a gogo)). Several stages welcom the group, from Brussels to Fontaine l'Eveque, from Mons to Leuven (Marktrock podium contest) and back in Brussels (Ancienne Belgique, Marktrock podium finals). On the festival 'fêtes de la musique 1998', hubbub becomes a trio once again, after marc chooses a different direction (he's part of Moxie now). Hubbub records for the second time during the summer of 1998, in the Jet Studio, Brussels. Reactions in Rif-Raf & Vers l'avenir, and on StuBru and 21. The group meanwhile continues to play live-gigs from Thuin to Rixensart, from Louvain-la-Neuve to Brussels. The current goal is to get as many reactions as possible, and to play as much as possible and bring a firm, energetic set. - Vers l'Avenir : "Musicalement ce trio "classique" (guitare, basse, batterie) pratique un rock assez puissant, volontiers mélancholique et sans surcharge quie suscitera peut-être un jour l'intérêt d'un label". - Rif-Raf (december '98) "Le titre qui démarque le plus a pour titre "Kill You" et est assez bizarre, incluant même un guitare surf. Les 3 autres ressemblent tout de même très, trop, aux Pixies qu'on laisse passer ça sans rien dire. Ceci dit, Hubbub fait du meilleur Pixies que Frank Black & Kim Deal n'en sont aujourd'hui capables. On les excuse donc ..."
For the fact alone that this group was the first one smart enough to send in it's demo-packet to "The Belgian Pop & Rock Archives", this effort merits some praise. But on the 4-track cd, published by themselves on 300 copies, there is also enough interesting material in the rich anglo-saxon guitar-tradition (Pearl Jam, Pixies, even some surf ...) to do that. The best track - IMHO - is "I want my time", the most energetic song on it, that could easily build a career in the Alternative Charts with some airplay. I think we'll hear more from these guys. Rue Renneau Fosse 12, 1350 Jauche.